Protected under U.S. Patents # 8,725,831,# 8,718,671, # 8,249,807, # 8,036,679, # 8,138,907, # 8,169,342, and # 8,548,724. The Location-Aware Information Systems Client (LAISYC) is a comprehensive location-aware framework supporting intelligent real-time mobile applications. LAISYC is able to adapt to real-time application requirements for location sampling resolution and timeliness of updates to a server while preserving critical mobile device resources such as battery life. TRAC-IT – a mobile app that collects travel behavior data in real-time, and can also provide real-time location-based services (e.g., traffic alerts, location-based advertising) to the user. A Personal Travel Coach can provide personalized suggestions that may save the user time or money by streamlining their travel behavior. TACLAN – Tactical LBS system for real-time battlefield tracking and messaging between mobile devices and centralized dispatch station. Typical internet traffic is sent using the HTTP protocol, which involves a request made by a client (e.g., web browser, or a mobile device) and a response from a server. HTTP is typically supported by the underlying TCP protocol, which guarantees the delivery (or notice of failure) for every packet transferred from the client to the server. Traditional LBS apps gather location data for several hours, then compress the location data and perform a bulk upload to a server using HTTP/TCP. This is similar to previous models for data collection where the timeliness of the data is not important. However, to provide real-time LBS (e.g., alerting a user that they are approaching a traffic accident), data must be sent to the server more frequently, on the order of once per second for some LBS. However, sending data via HTTP/TCP, and confirming that every packet sent from the device to the server arrives successfully, places a large communications record-keeping overhead on the device and server, costing cell network bandwidth, mobile device battery life, and overall scalability of the system. Our LAISYC Communications Framework uses HTTP/TCP for normal communication with a server such as logging in, retrieving user profiles, etc. However, LAISYC uses UDP, instead of HTTP/TCP, to send location data in real-time between the device and server. UDP, unlike TCP, does not guarantee the receipt (or notice of failure) for every single location data packet. However, if location data is being sent frequently (e.g., every few seconds), then losing a single location data packet with a single position is not necessarily a problem. UDP has been used in the past for efficient Voice-over-IP and streaming video applications, since the same fault-tolerant approach works: if a single frame of video or packet of audio is dropped, the preceding and following packets typically carry enough information to fill in the gap. Basically, UDP trades off 100% reliability for efficiency. 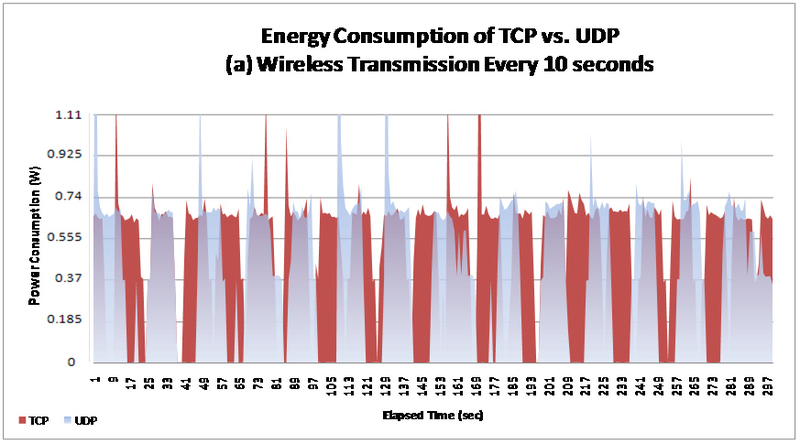 Experiments show that in one cell phone TCP consumes around 38% more power than UDP, resulting in a much larger impact on battery life (Figure 2). The functionality of HTTP/TCP versus UDP can be compared to sending a letter via registered mail (TCP), versus sending the same letter via normal mail (UDP). When using registered mail, the sender is assured that the letter will arrive at its destination, and the sender will receive confirmation when it is received or if the letter is lost. However, registered mail also costs more and involves more administrative overhead. Normal mail will deliver the letter the majority of the time, but occasionally a letter may be lost. As long as the sender is in frequent communication with the receiver, a single lost letter is not necessarily a big problem.